From a New York Times–bestselling author: A new kind of phone awakens the dead in this technological horror novel “reminiscent of Koontz at his best” (Booklist). Ever since his life was shattered by the kidnapping and murder of his young daughter, Peter Russell has become a ghost of a man. Once a successful director of adult films, he has been reduced to running questionable errands for an eccentric California millionaire. But everything changes when a Los Angeles start-up offers him the opportunity to create promotional videos for their revolutionary new technology, Trans. The product offers exceptionally powerful, crystal-clear mobile communication that can operate anywhere and everywhere—and Peter sets out to put it into every palm. But as he uses the device himself, he starts to see his murdered little girl . . . Soon, there are other voices—disembodied, confused, angry—emanating from a newly invaded dimension. Many are even malevolent . . . and hungry . . . and deadly. As the death toll of Trans-users skyrockets, Peter’s life begins a new spiral downward. Now, he must race to make sense of the horror Trans has wrought before the gateway to Hell bursts wide open. 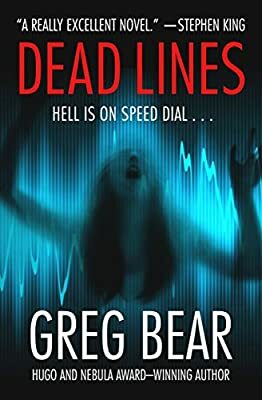 With Dead Lines, author of the Eon series Greg Bear transforms the literary realm of Dean Koontz, Peter Straub, and Stephen King into something unique by ingeniously blending the speculative with the supernatural. You’ll never look at your phone the same way again.